In 1980’s, stability of underground excavations was a major problem facing the mining industry, especially with the mine workings reaching greater depths in the country. Planning and designing efforts in metalliferous mines were inadequate. In view of this, there was an urgent need for trained and competent rock mechanics engineers to tackle problems of rock mechanics and ground control in mines. There was no institute to look after the problems of hard rock mining and other civil engineering projects. Consequently, many project authorities in India were taking the help of foreign consultants to solve their rock mechanics problems. In view of above, there was an urgent need to supplement the above facilities by establishing a Rock Mechanics Research Centre, exclusively to tackle the problems of stability of underground excavations in hard rock mines, particularly at deeper levels, and in other civil engineering projects. At Kolar Gold Fields in the state of Karnataka, gold mining activities were going on with one of the deepest underground mines in the world. The mining activities at the Kolar Gold Fields over a period of century helped the Research & Development Unit of Bharat Gold Mines Limited to gain unique expertise in solving hard rock deep mining problems pertaining to rock mechanics and ground control. The uniqueness of the KGF mines was recognized by many mining institutions in the world. The Research & Development Unit of Bharat Gold Mines Limited at Kolar Gold Fields was functioning since pre-independence. The Rock Mechanics Cell and Seismic and Micro-seismic Cell of this Unit have done pioneering work in the field of rock mechanics in non-coal mines, which has been recognised internationally. The Rock Mechanics Cell has carried out investigations on the rock mass movement, in-situ stress conditions, and the rock mass movement characteristics due to rock bursts, including laboratory investigations into the physico-mechanical and elastic properties of rock. 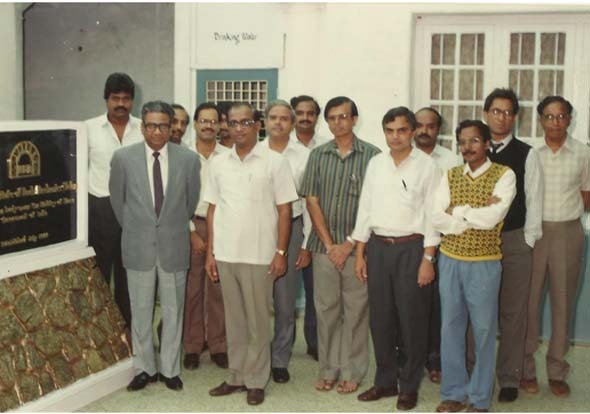 The Seismic and Micro-seismic Cell was established with the collaboration of Bhabha Atomic Research Centre and was continuing since 1978 for evaluation and prediction of ground stability in mine excavations prone to rock burst. Seismological analysis of the stress regime of mine excavations was carried out to delineate high in-situ stress. Seismic technique provided support to monitoring stability in large and deep excavations. The mining activity in KGF mines was on the downward trend and the Government of India have, vide their letter dated 17th December, 1987, directed that the mines of Kolar Gold Fields be closed in a period of 7 years. It was proposed by an Expert Group constituted by the Secretary, Department of Mines, Ministry of Steel & Mines in 1987 that this Institute of Rock Mechanics and Ground Control be formed at Kolar Gold Fields with the Research & Development Unit of M/s Bharat Gold Mines Limited, which had developed expertise and experience in this field and recognition from the Department of Scientific and Industrial Research of the Ministry of Science & Technology as its nucleus. The Research & Development Unit of Bharat Gold Mines Limited had a well established Rock Mechanics Cell including a Material Testing Laboratory with qualified and trained personnel to tackle the problems of stability of mine excavations in hard rock particularly at deeper levels. Advanced rock mechanics instruments, including the hydro-frac tool, were used to study the strata movement and stress build up for the assessment of stope stability. The scientific personnel have acquired experience in this field for more than 20 years. Based on the rock mechanics research studies carried out in the Kolar Gold Mines, new mining system were designed and adopted which resulted in better ground stability and also a decrease in the frequency and intensity of rock bursts in KGF mines. Seismic and micro-seismic techniques were adopted to monitor the seismic activity and to predict rock bursts. As a complement to the rock burst research programme, tests on rock specimens for their physico-mechanical properties were carried out in the Materials Testing Laboratory. The expertise developed by the Research & Development Unit of Bharat Gold Mines Limited was also utilised to carry out studies on ground control for other mining organisations including the mines of Hindustan Zinc Limited and Hutti Gold Mines Limited, on a limited scale. The rock mechanics investigations carried out by the units have been acknowledged as to be of very high standard in the opinion of UNDP/ILO experts who visited the R&D Unit. Many metalliferous mines including Mosaboni mines of Hindustan Copper Limited, Mochia&Balaria mines of Hindustan Zinc Limited, Hutti& Chitradurga mines of Hutti Gold Mines Limited and mines of Manganese Ore (India) Limited were reaching deeper levels and were exposed to large areas of wall rocks resulting in severe ground control problems. This has called for a scientific approach based on sound rock mechanics principles to design the workings. The civil engineering projects too, with increasing tunnelling activity and need for construction of large underground caverns require the expertise of rock mechanics engineers to tackle their problems related to site characterisation, support design, numerical modelling and blasting. In view of above, there was an urgent need of establishing a Research Centre for Rock Mechanics and Ground Control to evolve new mining methods to promote productivity, safety and conservation in coal and non-coal mines and to solve the rock mechanics related problems being faced by the mining and civil engineering sectors in the country. In support of establishment of a Research Institute at Kolar Gold Fields, various meetings were held under the Chairmanship of the Secretary (Mines), Department of Mines, Ministry of Steel & Mines, Government of India. In addition, the renowned experts in the field of rock mechanics viz., Prof (Dr) A. Kidybinski, International Bureau of Strata Mechanics and Dr. Yung Sam Kim, UNDP Consultant on Rock Mechanics, too recommended for the establishment of a research institute at KGF. The Government of India vide their letter No.14/22/87-Met.V dated 27th January, 1988 has conveyed the sanction of the President for establishment of the Institute of Rock Mechanics and Ground Control at Kolar Gold Fields under Science & Technology (Plan) at a total expenditure not exceeding Rs.200 lakhs including a foreign component of Rs.40 lakhs. The Hon’ble Union Minister of State for Mines, Smt. 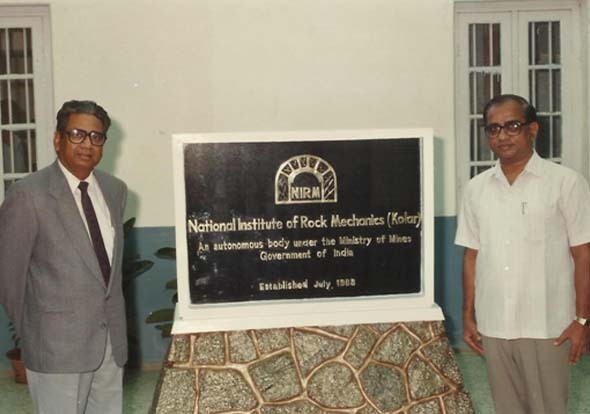 Ramdulari Sinha announced the approval of the Government of India for the establishment of the Institute of Rock Mechanics and Ground Control at Kolar Gold Fields while inaugurating the fifth plenary scientific session of the working group on “Rock Bursts” of the International Bureau of Strata Mechanics at the Regional Research Laboratory, Hyderabad on Tuesday, the 2nd February, 1988. The Institute was originally named as “Kolar Institute of Rock Mechanics and Ground Control” and registered under Karnataka Societies Registration Act, 1960 & Karnataka Societies Registration Rules 1961, as an autonomous research institute under the administrative control of Ministry of Mines, Government of India. Subsequently the name of the Institute was changed to “National Institute of Rock Mechanics” by a resolution of the General Body.